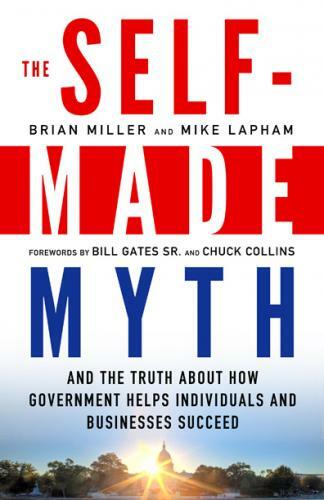 The Self-Made Myth examines how wealth is really created and why it matters – shaping our views on inequality, taxes, the role of government, the rights of workers, and more. No one in this country ever did it alone. Related Report: "I Didn't Do It Alone"
The Self-Made Myth, a book from UFE and Responsible Wealth, exposes the false claim that business success is the result of heroic individual effort with little or no outside help – a claim used to rationalize extravagant CEO salaries, extreme inequality, and tax breaks for the wealthy. The Self-Made Myth busts the myth by presenting profiles of business leaders who recognize the public investments and supports that made their success possible—including Warren Buffett, Ben Cohen of Ben and Jerry’s, New Belgium Brewing CEO Kim Jordan, and others. The book also thoroughly demolishes the claims of supposedly self-made individuals such as Donald Trump and Ross Perot. How we view the creation of wealth and individual success is critical because it shapes our choices on taxes, regulation, public investments in schools and infrastructure, CEO pay, and more. It takes a village to raise a business—it’s time to recognize that fact. Now available for purchase in stores and online! For more information please contact co-author (and UFE's Responsible Wealth Project Director) Mike Lapham.